Fresh off the boat from Aotearoa, Modern Maori Quartet were back in London to treat us to an awesome Sunday afternoon of entertainment before heading up to Edinburgh to debut their new Fringe show “Two Worlds”. A packed Bush Hall was oozing with anticipation as New Zealand’s favourite showband took to the stage with a repertoire of known favourites, as well as a few tasters from the Edinburgh show. James Tito, Matariki Whatarau, Francis Kora and Tainui Kuru made the line up this time around, and the boys really allowed their individual personalities and characters to shine through. Their opening promise: “It’s our job to make you homesick” was convincingly achieved, as the “flash Maori garage party in suits” gave us a tasty combo of their own tunes, Kiwi favourites such as ‘Pokarekare Ana’, and some of their personal favourites from the great showbands of the 50s and 60s who have inspired them – especially the Hi-Marks, who the boys cheekily say “we’re basically trying to be them”. If anyone doubted their ability to make London Kiwis homesick, all doubts evaporated with their highly unique and passionate rendition of Dave Dobbyn’s ‘Welcome Home’. The Bush Hall preview was a professional, polished, and yet humble performance, where you could certainly appreciate their training as actors at Toi Whakaari (New Zealand Drama School) – but what ultimately shone through was their sincerity and generosity – four ordinary Maori lads who were there to entertain and ensure that everyone had a good time. A highly interactive experience, where the children in the room undoubtedly felt as treasured as the adults. The Edinburgh Festival show has been six years in the making; the first show they have ever written, and has been adapted for international audiences. 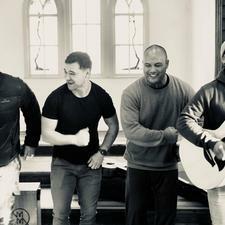 The quartet have pitched themselves as “the Jersey Boys meets the All Blacks” – and Fringe audiences are definitely in for something very special. 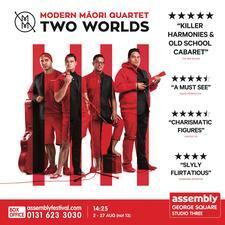 We wish MMQ all the best for Edinburgh... if you’re in town for the festival, be sure to check them out! Two Worlds plays at The Assembly (Studio Three), George Square, at 2.25pm August 2nd to 27th (no performance August 13th). Box Office: 0131 623 3030. Charlotte Everett has been contributing to NZNewsUK as a columnist and journalist since 2011, and currently serves as London Editor – a post she has held since mid-2013. She has been based in London since mid-2007 and has a broad writing portfolio, including music/entertainment, theatre reviews, travel, rugby, Kiwi success, vegan food, and WW100/ANZAC. She is also an experienced freelance tour guide, and leads city walks across London (as well as day trips to Oxford) several times a week. You can follow her on Twitter or Facebook.